From the garden to the countryside you will find wildflowers growing in profusion and somehow this colourful scene brightens the day. 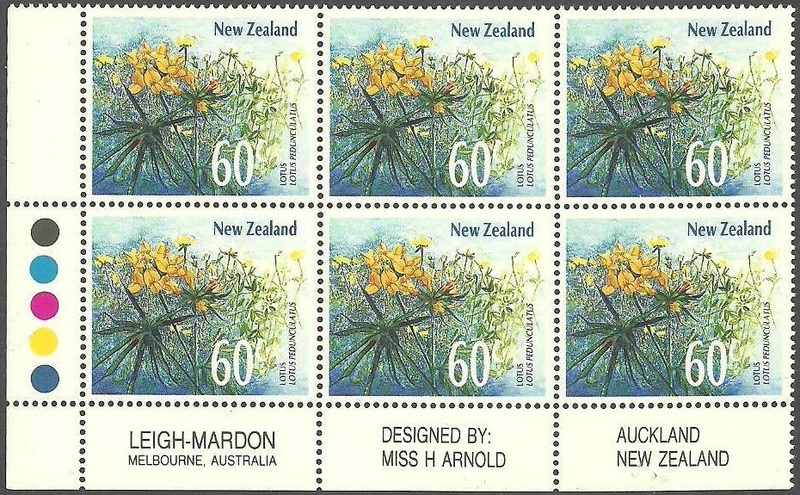 This set contains four introduced pasture or garden flowers which were probably planted by early settlers to remind them of 'home'. The seeds were carried by wind, water and animals to places far beyond the original gardens and now provide colour along our roadsides and over the countryside. 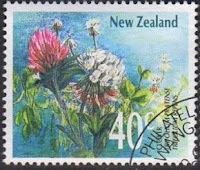 In some cases, plants such as the Clover have become assets to New Zealand while others, such as the Wild Ginger they have become problem weeds that people are now encouraged to remove. 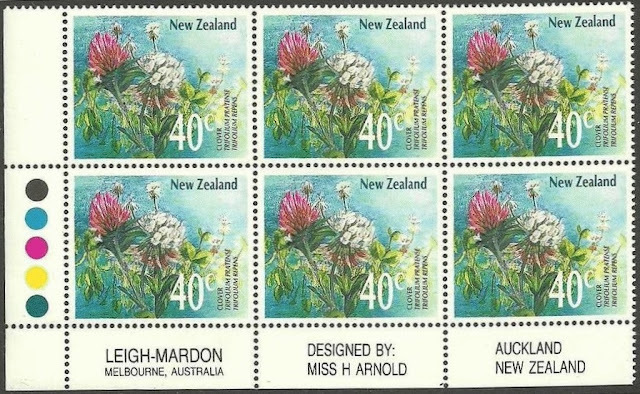 I have included both mint and used examples of each of the four stamps. 40c - Clover (Mint). 40c - Clover (Used). The delicacy of its bloom belies the fact that the clover is an extremely hardy and virile plant. Introduced originally from Europe to improve nitrogen levels in pasture, various strains of clover have since been bred but the two pictured here are probably the most familiar. The fragile flowers of the hard working White Clover (repens) and the Red Clover (pratense) can be seen and enjoyed in pastureland throughout New Zealand. 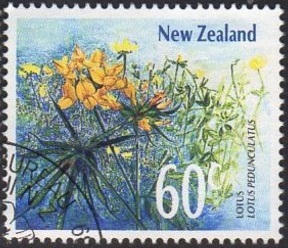 60c - Lotus (Mint). 60c - Lotus (Used). The exotic name given to this European birdsfoot trefoil becomes remarkably apt when the golden bloom is studied closely. The intensity of the colour is almost too rich, too out of place, for a simple wildflower. From its European ancestry, the lotus has inherited a distinct preference for the more moist climate often found in the high country. 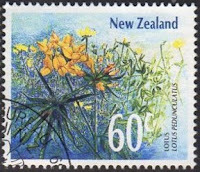 Why the lotus has been blessed with such beauty no one knows, but those who find it, mingling so well in the New Zealand landscape, can create their own reasons for its attractiveness. The lotus has a history shrouded in mystery and it can be planted in pasture, but mainly runs wild. 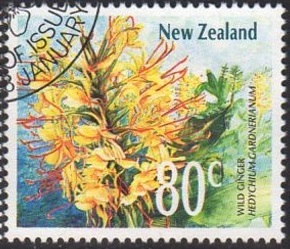 70c - Monbretia (Mint). 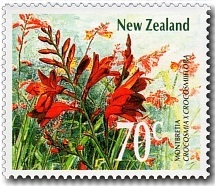 70c - Monbretia (Used). This native of southern Africa has settled happily in the warmer damp areas of New Zealand. The Monbretia bulb mixes with the roadside grasses of districts such as Northland and Westland adding a distinct orange hue with a multitude of tiny spikes of blossom. 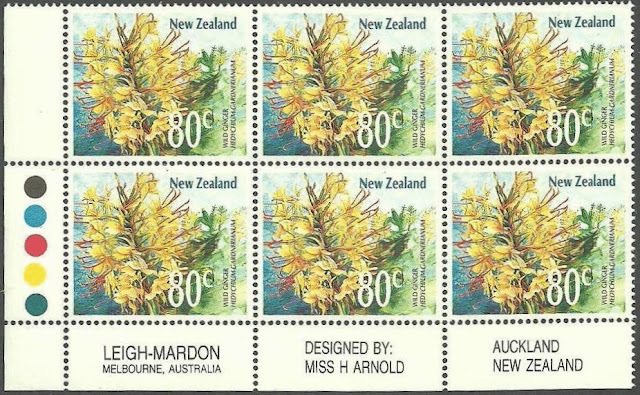 Early travellers introduced these bulbs to beautify their gardens but, as with so many varieties before and since, the monbretia "escaped" to revert to its original wild state. 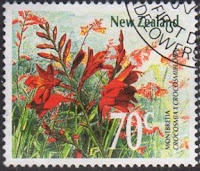 The unharnessed informality of the growth pattern over the generations has added great charm to the monbretia's chosen habitats in its adopted country. 80c - Wild Ginger (Mint). 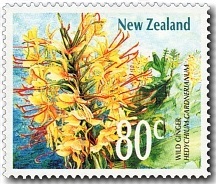 80c - Wild Ginger (Used). Wildflowers have reached the shores of New Zealand from all manner of faraway places. Wild ginger was probably brought here by early colonists as a small reminder of home. However nature soon scattered the seeds of these wildflowers far beyond the confines of the settler's gardens and, today, two wild ginger varieties have established themselves throughout the New Zealand countryside. The yellow tinted flower (gardnerianum) adorns the Himalayan wild ginger while the Indian wild ginger has a pale creamy bloom (hedychium flavescens). 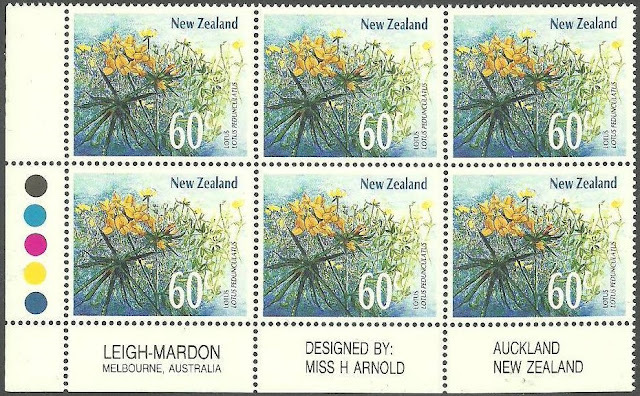 Being so far from their native lands seems of no consequence to these delightful wildflowers as they grow in beautiful profusion to provide a dash of colour to the roadsides and rural districts of New Zealand. 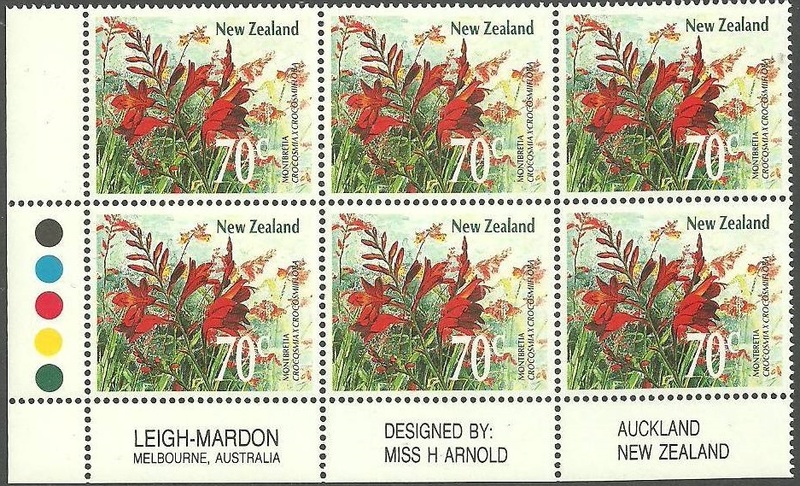 Plate Blocks - Collector Items. showing printer's 'traffic lights' on the side, with the designer and printer across the bottom. 40c - Clover (Plate Block). 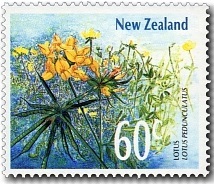 60c - Lotus (Plate Block). 70c - Monbretia (Plate Block).